Space aged slots come in all manner of designs, which is something that Net Entertainment’s Cosmic Fortune slot proves. 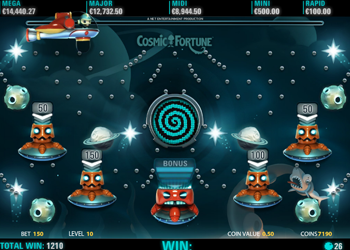 Whilst many online slots try to go for a futuristic approach with their space-age themes, Cosmic Fortune appears to have taken a step back to the age of pinball. The slot still contains nothing but the sharpest 3D graphics, though. The imagery upon the reels is quirky, and zany. If you want to experience how something so simple can be done so well with a space-themed slot, though, just wait until you hit the bonus round. 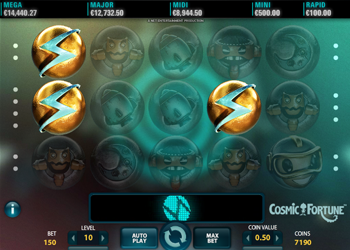 We’ll come to that a little while later in our online slot review of Cosmic Fortune. Cosmic Fortune has been designed in the same simple manner as many other Net Entertainment slots, in that it features just 15 pay lines in total, spread upon 5 reels. None of these paylines are adjustable, but with so few to play with, you won’t need to anyway. What you can alter are the value of your coins, and the amount of coins you stake per line. Coin sizes can stem from a low of 2p up to a high of 50p. Net Entertainment offers a betting level button, so that you can stake between 1 and 10 coins per line on this slot. 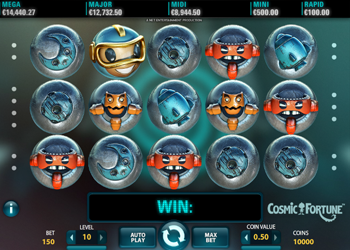 Given that, Cosmic Fortune is going to set you back anything from 30p per spin, up to £75 per spin. There are not a vast amount of paying symbols in this game, which is a good thing. The fewer symbols that appear in Cosmic Fortune, the better your chances of landing a win. The moon, rocket, asteroid and orange robot are the lower paying symbols in this slot, offering wins that range from 3 coins up to a total of 200 coins. If you want bigger wins, you’ll need the more creative and colourful icons to appear on the reels. These can include the red robot, the alien, and the cosmonaut himself. By landing these symbols in winning combinations of Three of a Kind, up to Five of a Kind on the reels, players can pocket wins from 20 coins up to 1,500 coins in Cosmic Fortune. The “W” orb acts as Cosmic Fortune’s wild symbol. It can only appear on the second, third and fourth reels, but it does so entirely at random, and can replace all other icons in the slot, save for the scatter symbol. The wild is present in both Cosmic Fortune’s base game, and free falls bonus round. Should a player land three of the scatter symbols on the reels, then they will trigger a free falls bonus. This bonus consists of 10 games, with each additional scatter in the base game, giving you another 5 free fall games to play. Free falls are also known as “avalanches”, and basically see winning symbols replace with new ones dropping down from above. After your free galls game is complete, another free galls bonus begins. This games acts a little bit like a game of pinball. Marbles will fall through the bonus game and can land in either coin winning cups, or Jackpot Collector’s cups. Naturally, players can win coins if they land marbles in their respective cups, but if they land three marbles in the Jackpot Collector’s Cup, a jackpot bonus game begins. Cosmic Fortune’s Jackpot Bonus works in the same way as the pinball-designed free falls bonus. There are three progressive jackpot cups, and two standard fixed jackpot cups on the screen, as well as standard coin cups. If the player lands three marbles into any of the jackpot cups, they will pocket the progressive jackpot for that respective cup. The two non-progressive jackpots include Rapid and Mini jackpots (worth £100 and £500, respectively), whilst the progressive jackpots include Midi, Major and Mega jackpots, which can reach any figures. The longer they remain un-won, the more they will be worth. 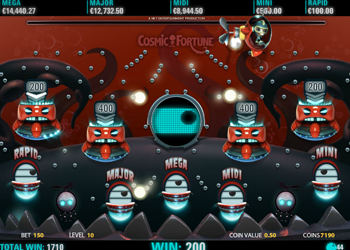 Cosmic Fortune is a superb title, and it adds classic game play to its modern look, via its pinball styled bonus. Cosmic Fortune is just one of many top quality Net Entertainment developed online slots, which you can find at Guts Online Casino. If you are new to Guts Casino, they will offer you a welcome bonus worth £300 on your first deposit, as well as 100 free spins on another NetEnt classic, Starburst, when you decide to play with them.